Disney artist Carl Barks (1901-2000) created one of Walt Disney's most famous characters, Scrooge McDuck. Barks also produced more than 500 comic book stories. His work is ranked among the most widely circulated, best-loved, and most influential of all comic book art. Although the images he created are known virtually everywhere, Barks was an isolated storyteller, living in the desert of California and preferring to labor without public fanfare during most of his career. He created work of such exceptional quality that he was accorded the greatest autonomy of any Disney artist. He is the only comic book artist ever to receive a Disney Legends award. The influence of Barks's work on such filmmakers as George Lucas and Steven Spielberg and on such artists as Gottfried Helnwein has extended Barks's significance far beyond the boundaries of comics. After Barks's death at the age of ninety-nine, Roy Disney praised him for his "brilliant artistic vision." 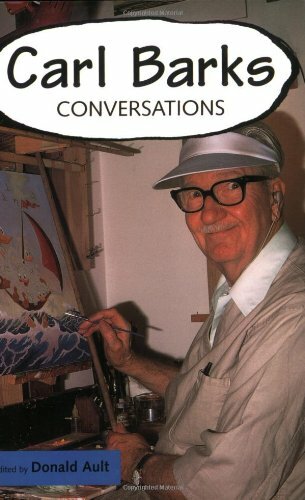 Carl Barks: Conversations is the only comprehensive collection of Barks's interviews. It ranges chronologically from the very first one (with Malcolm Willits, the fan who uncovered Barks's identity) to the artist's final conversations with Donald Ault in the summer of 2000. In between are interviews conducted by J. Michael Barrier, Edward Summer, Bruce Hamilton, and others. Several of these interviews are published here for the first time. Ault's friendship with Barks, ranging over a period of thirty years, provides an unusually intimate resource not only for standard q&a interviews but also for casual conversations in informal settings. Carl Barks: Conversations reveals previously unknown information about the life, times, and opinions of one of the master storytellers of the twentieth century. Donald Ault, a professor of English at the University of Florida, is the author of Narrative Unbound: Re-Visioning William Blake's The Four Zoas and Visionary Physics: Blake's Response to Newton. His work has been published in Studies in Romanticism, The Wordsworth Circle, Modern Philology, and The Comics Journal.